How Did Greenwich Support the Red Cross? 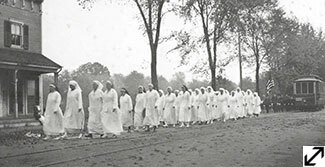 Greenwich established a chapter of the American Red Cross in October 1914. June 28, 1917, the Greenwich chapter had exceeded its $100,000 fundraising goal by $50,000. 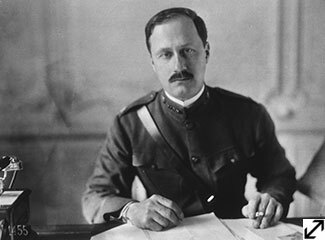 Major James Handasyd Perkins, American Red Cross High Commissioner for Europe, c. 1918, Courtesy Light, Inc.
On June 2, 1917, James Handasyd Perkins sailed with the first American Red Cross commission to France as Deputy Commissioner. In September he was appointed Commissioner to France and then in February 1918 Commissioner for Europe. On January 29, 1919, he was honorably discharged from military service. In recognition of his service and the energy, spirit, resourcefulness and devotion with which he developed the mission of the Red Cross in the War, he was awarded medals from the United States, France and Belgium. Among Greenwich residents stationed in Europe were James Perkins, head of American Red Cross operations in Europe; Charles F. Rudloff, Jr., recipient of the Croix de Guerre for his service as an ambulance driver; and Bertha Boles, Physical Director for the Orthopedic Division of the Army's Construction Unit. Nurses Group, Old Greenwich Red Cross, c. 1918. Greenwich Historical Society, William E. Finch, Jr. Archives, Photograph Collection. The Red Cross was founded as an apolitical organization designed to help both sides during war. For the American Red Cross, all that changed once the United States entered the War in 1917. President Wilson made it an adjunct of the United States Army and directed it to solely aid the Allied Powers. The American Red Cross delivered medical care at military hospitals, operated ambulance services in the war zone, provided relief to refugees, ran canteens for soldiers and coordinated the efforts of all American relief agencies. Between 1917 and 1919, 31 million Americans joined the Red Cross as members and the group raised over $400 million in funds and donated goods. Greenwich residents strongly supported the Red Cross. Listen to the work of the Red Cross in Europe from Perkins. ©2019 Greenwich Historical Society. All rights reserved.